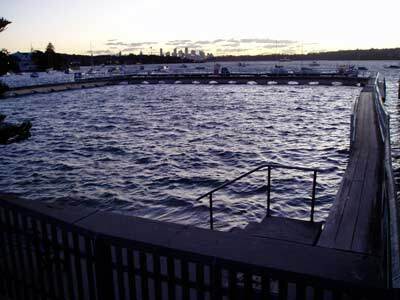 There are a large number of swimming pools within Sydney Harbour. The more famous of these are Clifton Gardens, Balmoral, Neilsen Park, Manly and Parsley Bay. The main attraction of these pools as far as scuba divers are concerned is sea horses. They are normally home to White's or Sydney sea horses rather than big belly sea horses. 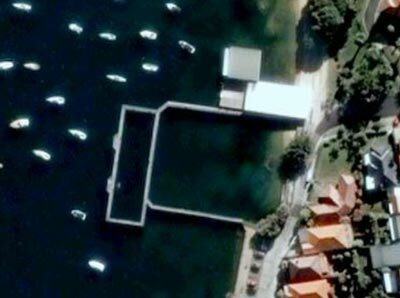 Another pool is Watsons Bay Pool. This is located only a hundred or so metres from the famous Watsons Bay Hotel and Doyles Seafood Restaurant. This pool is probably the closest one to Sydney Heads and the open ocean so should theoretically have the cleanest water. To find this location, drive towards South Head from the City along New South Head Road or from Bondi along Old South Head Road. When you arrive at the intersection of both these roads, continue along Old South Head Road till you pass The Gap and arrive at the roundabout at the intersection of Robertson Place. Turn left and head straight ahead into Marine Parade. In front of you there is the Vaucluse Yacht Club. The road turns left and follows the water's edge to the pilot base. There is a small carpark on the right side of the road, park here. Once out of the car, you will see the pool which is between the carpark and the yacht club. You can walk out on the pool boardwalk to examine the site. A brief description of the pool: the pool has a very small sandy beach with a wheelchair accessible ramp. The sides of the pool run to the west from the beach (which is north-south). The pool is actuially made up of two parts. The older section (closer to the beach) is about 50 metres long and 50 metres wide. The pool does not have a net like most of the Sydney Harbour pools, it has a series of vertical bars (like a jail) which run from the sand to the boardwalk. The western and northern side of this section of the pool has a sort of arched structure that supports the boardwalk and the bars. At the end of this section, there is another newer (but still old) pool. This is about the same width as the other section, but offset to the south by about five metres. It is about 20 metres long. As mentioned, in between the two parts there is a section of boardwalk and the bars that were along this section have been removed, although there are some remains on the northern side. There are also a large number of ladders that exit the water at various locations. However, I would not recommend using them and there is really no need to, you can exit onto the beach and then walk up the ramp. After gearing up, walk out to the section of boardwalk that is between the two parts of the pool. It is a high drop into the water, but not too bad. The depth is over three metres so it is safe to jump in. Drop to the bottom and head west under the boardwalk. Follow the edge of the pool, with the bars on your left (at first south). The bottom is composed here of a rocky bottom with lots of kelp and weed. The bars of the pool can sometimes be hard to see due to the kelp and weed. There are also some sponges on the bars. 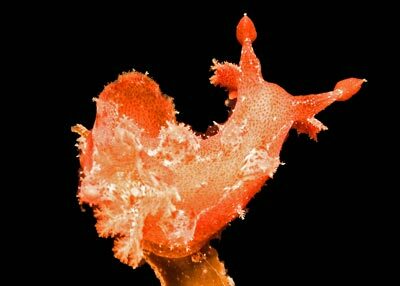 Have a look around and you should be able to see some Whites sea horses. I found a few on the kelp and my buddies found some on sponges on the bars. As mentioned, you you first head west and then south before meeting the first corner of the newer pool. Head west along the bars and look around all the kelp. This is the sortest section of the "net" and after only 20 metres you will turn north for 50 metres. After about five metres you will notice a small rock overhang. This section of the pool has a rocky bottom and a sort of rock platform sticks out from the middle of the pool towards the western side. 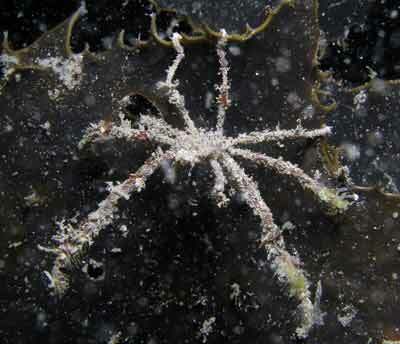 Look under and you may see some cuttlefish, pineapplefish or crabs. Continue along this side and you will have by now noticed that there is a heap of junk in the pool. Bits of timber, rusty steel and other junk almost cover the bottom in spots. This also gives homes to a lot of creatures. Keep an eye out for anglerfish and red Indiianfish (I have not seen either - although I would not expect to see RIF), blue-ringed octopus (I have seen one), nudibranchs and more. 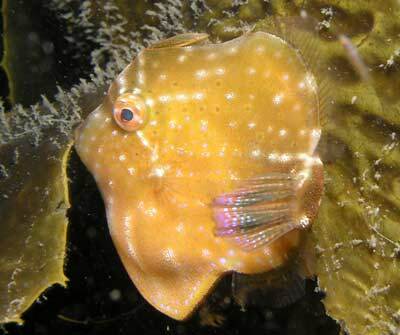 The on creature you will certainly see a lot of are pygmy leatherjackets. These range in sie from tiny ones about 10 mm long to larger 75 mm long ones. Colours can also vary a bit. Along this side the depth will get to over 6 metres. Towards the northern side the bottom has a bit more sand. Once again, turn right when you reach the end and follow the side for 20 metres. You will see above you (and both sides) that you go under one of the arches (these are quite visible as they are painted white on the arch bottom). Turn left once through the arch and after five metres you will come to the north-western corner of the main pool. All along this section the bars are supported by the arches. There are more ladders along here. The depth will start to come up and when you are in about 2 metres I would suggest turning around. Follow the net back to the spot yu came through from the smaller pool and then follow the arches south. You will see that the bars here have been cut off about 200 mm from the bottom and other parts lie on the bottom. After about 50 metres you will come to the south-western corner of the main pool. Turn left and follow the edge to the east. Again, when you reach 2 metres, turn around and come back again. Follow the natural edge to the middle of the divide between the two pools and then head have a look in the middle of the smaller pool and then head under one of the arches into the main pool. Zig-zag along the bottom as you head east. This way you will see a fair bit of the main pool. Keep an eye out for whiting, flathead, small rays and flounder on the sand. 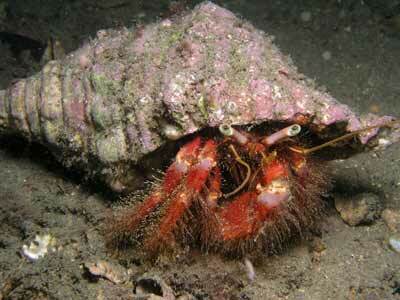 You may also see large tube anemones and sea pens. Exit on the ramp. This is a nice dive, but best suited to night diving. It may also be good when seas are up and other locations in Sydney are undiveable. Note that I would expect that in Summer, parking would be hard to get. Afterwards, get some fish and chips from the wharf at Rose Bay or have a beer or two in the Wtasons Bay Hotel. Another option here would be to do the outside of the pool, by entering on the northern side of the yacht club and following the outside of the pool to the west and then south before heading east to the promenade and exiting on some steps near the carpark. I will try to do this dive soon and update the pages with what I find.